Congratulations on your admission to UChicago. We are excited to welcome you as a member of our community in the fall and look forward to supporting your academic journey as a proud student in the College. Stay on track by completing important tasks. Read information and updates from the College. Visit the College Admissions portal. Welcome to the UChicago community of parents and families. As your student begins to make the transition into the College, we know that there will be a period of transition for you as well. 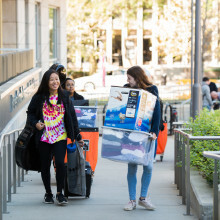 As a parent or family member of a UChicago student, you are considered part of the extended UChicago community. We hope you will take advantage of the many opportunities we offer to engage with the faculty, staff, students, and alumni on campus and around the world.